Hello. My name is Gill Morris and I'd like to introduce you to South Minster Kitchens. 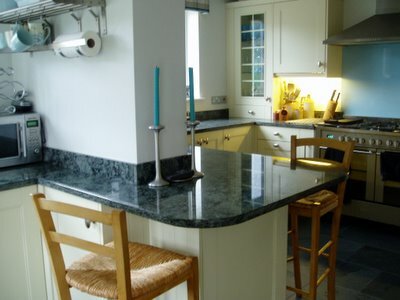 Based in Godalming in Surrey I am an experienced kitchen designer and can provide you with your dream kitchen. No pressure. No failed promises. Just a great service, a high quality product and excellent value. Nice Picture. I am looking forward to more. I have delivered to you a few times and often wondered how good your kitchen design are. From the picture they look cool. Hope you and your Husband stay in business for a long time. Every day we appreciate our beautiful kitchen; quality units including magic corners, pan drawers and appliances installed by Gill's wonderful team who appreciate the importance of attention to detail. The workmanship is excellent. Having a new kitchen is exciting, but stressful; Gill's efficient project management meant that everything went smoothly and any unforseen hiccups were dealt with quickly and efficiently. Gill from South Minster Kitchens really helped us turn our ideal kitchen ideas into a reality. The result is better than we ever imagined. Gill showed buckets of patience whilst I changed my mind dozens of times but she held my hand all the way. Great experience and fantastic end result. I live in sunny Godalming with my husband. It took me until I was 39 to decide what I wanted to do with my time. I set up South Minster Kitchens over three years ago, having worked for one of the major UK kitchen companies for over two years. I wanted to supply something that was not available from the bigger companies - a personal service with attention to detail. I listen to what my clients want, find out how they live and what they need from their kitchen, and I deliver. I enjoy going on holiday. Skiing in the winter, walking in the summer, chilling by the pool if time allows!